But for the first time in four years, the picture is not so gloomy in the north-east of Scotland. According to the Royal Institution of Chartered Surveyors (RICS), the Scottish housing market ended 2018 on a weak note, with national sales volumes dwindling in December. But figures from Aberdein and Considine suggest Aberdeen and Aberdeenshire are bucking the trend. Robert Fraser, senior property partner at the firm which has 19 offices throughout Scotland, said: “As the RICS figures demonstrate, uncertainty is beginning to weigh on the property market nationally – with some people adopting a ‘wait and see’ attitude. “However, it is a slightly different picture in the north-east corner, which has seen its rebound from the oil and gas downturn continue despite the turbulence at Westminster. “As we saw after the credit crunch in 2008, the health of the North Sea energy sector is a better barometer than any other national issue. With many oil service companies recruiting again, there are consistent signs that the housing market, too, is returning to prosperity. Despite the somewhat bleak outlook in the rest of Scotland, house prices are reported as steady, with 19% of respondents reporting growth in the last month of the year. But that positivity stalls with prices expected to fall over the next three months, while the 12-month outlook remains broadly the same across the UK. 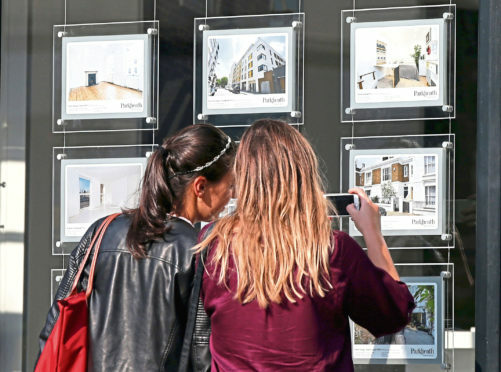 Simon Rubinsohn, Rics chief economist, said: “It is hardly a surprise with ongoing uncertainty about the path to Brexit dominating the news agenda that even allowing for the normal patterns around the Christmas holidays, buyer interest in purchasing property in December was subdued.